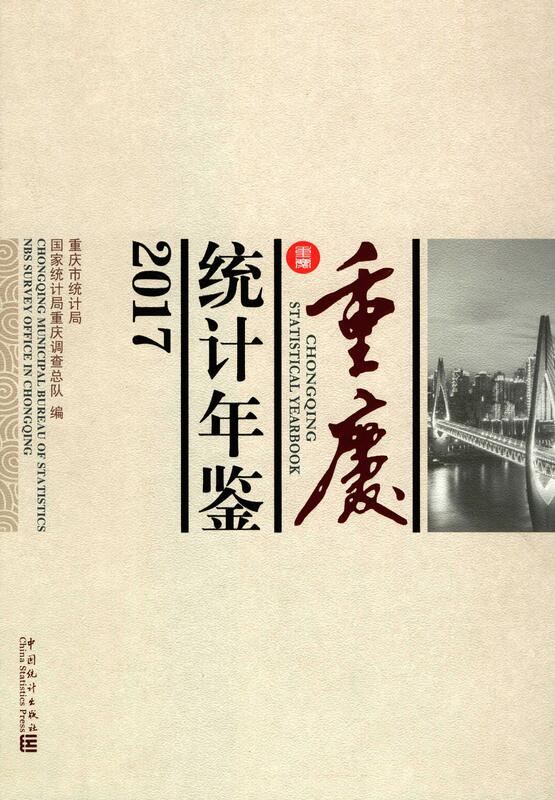 Ⅰ.Chongqing Statistical Yearbook 2017 is a large statistical yearbook compiled by ChongqingMunicipal Bureau of Statistics and NBS Survey Office in Chongqing and published by China Statis-tics Press,which records the economic construction and social development of Chongqing in anall-round way.The yearbook covers the comprehensive data on Chongqing's social and economicdevelopment in 2016 and some major years in the history,as well as the major statistics on all thedistricts and counties(autonomous counties). Ⅱ.The yearbook contains 22 chapters,namely 1.Comprehensive Statistics;2.NationalEconomic Accounting;3.Population and Employment;4.Investment in Fixed Assets;5.EnergyConsumption;6.Government Finance;7.People's Livelihood and Prices;8.Urban Construction;9.Resources and Environment;10.Markets of Key Factors;11.Agriculture and Rural Econo-my;12.Industry;13.Construction;14.Transport,Postal and Telecommunication Services;15.Domestic Trade;16.Foreign Economic Relations,Trade and Tourism;17.Financial Intermedia-tion;18.Education,Science & Technology and Culture;19.Public Health,Sports and OtherSocial Activities;20.Districts;21.Resettlement of Chongqing Reservoir Area of Three GorgesProject;22.Statistics on Basic Units.There is also an Appendix which covers the main data of thewhole nation and other provinces,autonomous regions and municipalities.There is a Brief Introduc-tion at the beginning of each chapter,which introduces the main contents of the chapter and thesources of data.The Explanatory Notes on Main Statistical Indicators is provided at the end of eachchapter. Ⅲ.The data in this publication:most of the data are obtained from the annual statistical reports,while some others are obtained from sample surveys. Ⅳ.The units of measurement used in this yearbook are international standard measurementunits;and the basis of classification of this book complies with the national uniform standard. Ⅴ.The statistical discrepancies of the total values or relative values due to rounding are notadjusted in this yearbook. Ⅵ.The notes concerning individual indicators are placed at the lower part of the table or thelower part of the last page. Ⅶ.Notations used in this yearbook:(blank space)indicates that the figure is not large enoughto be measured with the smallest unit in the table,or data are unknown,or are not available;“#”indicates a major breakdown of the total. Ⅷ.We'd like to send our sincere acknowledgement various units and comrades for their vigor-ous assistances during the edition and translation of this yearbook.Due to our limited ability and thehasty time,faults and shortage are unavoidable.Any criticism or suggestion is appreciated.